Mobile entertainers, bands and nightclubs can get their acts “glowing like the pros” with a new series of professional color-mixing Quad LED par cans from American DJ. The company’s newly-debuted Flat Par “Q” Series consists of four low-profile par models, each featuring cutting-edge Quad-Color Technology, with either RGBW (red, green, blue white) or RGBA (red, green, blue, amber) 4-in-1 LED sources. Powerfully bright and DMX compatible, the ultra-slim units offer smooth color mixing and vibrant hues, without the distractive RGB shadows typically produced by single-color LED sources. 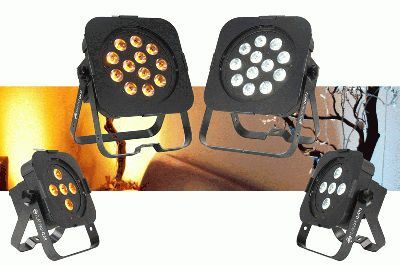 The series includes two RGBW models: the Flat Par QWH5, powered by five x 5-watt 4-in-1 RGBW LEDs; and the larger Flat Par QWH12, containing 12 x 5-watt RGBW LEDs. The addition of a white LED source to the RGB mix makes it possible to produce a true cool white, along with a palette of soft pastels. There are also two RGBA models in the series -- the Flat Pat QA5 and the Flat Par QA12 -- which, like their RGBW counterparts, are equipped with five and 12 x 5-watt RGBA LEDs respectively. Having an amber LED source allows the Flat Pat QA5 and the Flat Par QA12 to achieve the desirable but hard-to-achieve warm orange and amber hues. All four models in the series feature American DJ’s new sit-flat design, with all of their power and DMX Ins/Outs intelligently positioned on the side of the fixture rather than the rear. This innovative “sideways” placement allows the units to sit directly on the ground, making them ideal for uplighting, and also to fit easily into trussing as truss toners. Featuring a 40° beam angle and equipped with dual hanging brackets, the versatile pars can also be mounted overhead on walls or truss to color wash a stage from above. With long-life 50,000-hour-rated lamps, and very low power usage – just 34 watts maximum for the 5-LED models and 80 watts for the 12-LED models – they’re also ideal for permanent installations. Wherever they’re used, the Flat Par “Q” LED pars will make it easy for entertainers and venues to take their light shows to the next level because, along with their Quad Technology color mixing, they’re packed with professional features and effects. Each model includes 44 built-in color macros, a color strobe effect, 0-100% electronic dimming, fast or slow color change operation, and a gel frame for optional diffusion filters. All of the fixtures in the series offer 6 operation modes: Manual Color Mode; Color Change Mode; Color Fade Mode; Auto (Program Run) Mode; Sound Active Mode; and DMX-512 Mode. For even more flexibility, 8 different DMX modes are available – 1, 2, 3, 4, 5, 6, 7, or 8-channel. The Flat Par QWH5, QWH12, QA5 and QA12 can also be run wirelessly from up to 15 ft./4.5M using American DJ’s ADJ LED RC2 infrared wireless remote controller (sold separately). The units are linkable via 3-pin XLR cable and feature IEC AC In/Out outlets to daisy chain power (up to 7 units). They also include multi-voltage operation: AC 100-240V, 50/60Hz. Compact and lightweight, the Flat Par QWH5 and Flat Par QA5 each measure 10.75”L x 9”W x 4.5”H/ 272 x 230 x 115mm and weigh 6 lbs./2.5 kg. The Flat Par QWH12 and Flat Par QA12 each measure 13”L x 11”W x 4.5”H/ 328 x 280 x 115mm and weigh 7 lbs./3.2 kg. The Flat Par QWH5 and Flat Par QA5 each have an MSRP of $339.95, while the Flat Par QWH12 and Flat Par QA12 carry an MSRP of $599.95 each.